Rock Creek Roofing has been providing professional and precise roofing services to the Buffalo, WY area since 2012. Our services include general roof repair, shingle repair, shingle replacement and metal roof repair and replacement for all residential properties. For prompt, reliable roofing services, call us today. At Rock Creek Roofing, we approach each project as a partnership between our team and our clients. We work together toward a common goal—successful project delivery and complete customer satisfaction. Our team conducts business with honesty, integrity and respect, offering responsiveness, consideration and commitment to quality with every project. Your roofing repair or replacement receives professional supervision, attention to detail and skilled workmanship unparalleled in our field. 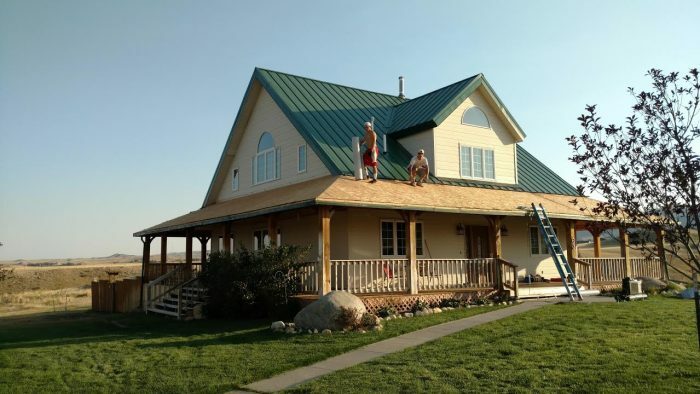 This dedication to excellence has made us the premier roofing contractor in Buffalo, WY. Our high level of customer care is the reason so many of our satisfied customers recommend us to friends, family members and neighbors. More than just a member of the Better Business Bureau (BBB) and the local Chamber of Commerce, Rock Creek Roofing is also a leader among roofing companies in Buffalo, WY. We enjoy an established reputation built on a strong sense of ethics and fairness. We offer an aggressive pricing mindset that allows us to provide competitive pricing for top-quality work. Our in-depth industry knowledge allows us to anticipate project challenges, develop solutions and meet client objectives. The final outcomes are an impeccable roofline and customers who consistently refer us to their friends and families. Contact us today to join our long list of satisfied customers and see for yourself the many advantages to choosing us for your roofing needs. We are members in good standing with the Better Business Bureau (BBB) and the local Chamber of Commerce. We offer prompt, reliable service that produces complete satisfaction. Our expertise includes both asphalt shingle and metal roofing. Our business is locally-owned and -operated. We offer snow removal services during the winter months. contact the experts at Rock Creek Roofing today. "I love how clean the crew kept the work area and all of the team members were easy to work with and professional. Kyle, the business owner i..."